Here at the Crozet Islands most remote field Cabin, Pointe Basse, we’re conducting a study of the personality of albatrosses, and linking their behaviour at sea with those we can measure at the nest. 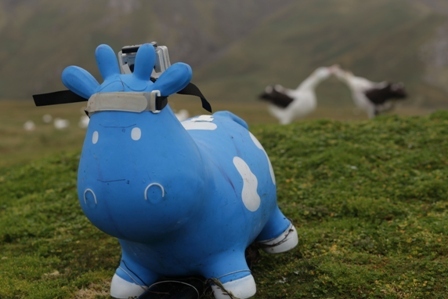 We’re doing this with the aid of an inflatable blue cow, named Betsy. Betsy helps us in testing how nesting birds respond to a novel objects. Their responses are noted by us, as we make the little bovine approach over a few metres on a long carbon-fibre pole. Birds seem to either pretend Betsy is not there, or in some of cases, snap at the cow and grumble as she approaches, sits for her chronometered 60 seconds in front of the nest, and then retreats. This allows CNRS Researcher Dr Samantha Patrick to place them on a personality continuum from shy to bold. We film the exercise, with a small wide-angle camera mounted on the cow’s horns and score the behaviours as they occur in the field. While the link to 19th Century English Literature may seem tenuous, the fascination of people for personality, its heritability and influence on our lives has been ongoing for almost as long as people have written novels. Edward Ferrars, a notoriously shy protagonist in Ms Austin’s 1811 novel Sense and Sensibility said “Shyness is only the effect of a sense of inferiority in some way or other”. Can this be true for albatrosses? Does being bolder or shyer accrue some benefits to the possessor of these traits? Is it easier to find food, or mates, or navigate life’s difficulties if, as an albatross, your character is of one type or another? Betsy takes a rest in the albatross colony as a group of young Wandering Albatross Diomedea exulans display in the back-ground. Photo: Susan Waugh, Courtesy of Susan Waugh. We’re linking the behaviours and personality types to the birds’ activity at sea. They’re satellite-tracked using miniature GPS devices, which we fit to the birds back feathers. After a turn a sea, the devices are removed and we download them to discover where the bird travelled to. Although the results of this study will take several months to analyse for Dr Patrick and colleagues at the CNRS, we’re already seeing some interesting outcomes. Male and females appear to have fairly discrete foraging grounds, and there’s some hint that age influences the distance and duration of foraging trips. 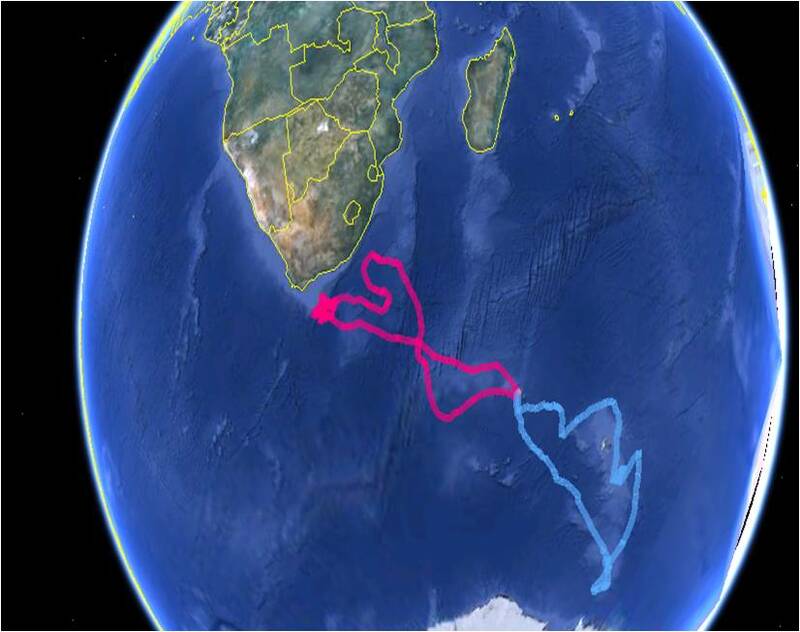 Wandering Albatross Diomedea exulans foraging tracks from GPS tracking work conducted by the CNRS from incubating birds at the Crozet Islands in 2013. The more northerly track of a female (pink) took the bird to waters off South Africa while many males such as the one shown here (blue) foraged near the Antarctic continent. Graphic Samantha Patrick, Courtesy of Samantha Patrick. Only with an exceedingly well-known group of individuals such as that at Pointe Basse, studied for over 40 years, are the strategies of particular birds making up a population able to be determined. We’re beginning to understand what a population does on average is rarely exhibited by any individual, and that a range of behaviours and strategies are used by different birds to make their living. The link between these strategies and their contribution to the growth of the population, i.e. which birds most successfully raise chicks year upon year, is still being probed into through this work. If the results are conclusive, and can be linked to heritability of traits, it will raise questions about whether certain individuals have a better chance, from the outset at making it back into the breeding population, and contributing in their turn to the next generation of albatrosses. Do bold birds prefer to pair with like individuals, and how is the mix of these traits maintained in the population? What effect does change in the environment, either human-induced or ‘natural’, have on the probability of birds of a particular type surviving? For example, are bold birds more likely to interact with dangers in their environment, such as fishing hooks, or more likely to succeed in competitive exchanges for food, or other resources? 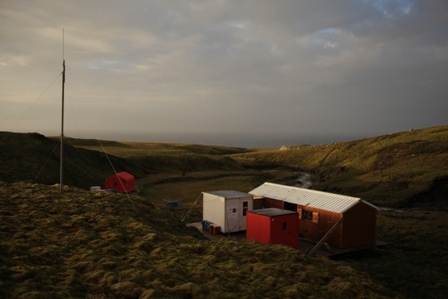 The field accommodation at Pointe Basse albatross colony can house 6-8 researchers, and is well stocked with provisions to allow monitoring of the colony during ciritical periods throughout the year. Photo: Susan Waugh, Courtesy of Susan Waugh. The benefits of long-term research programmes, such as that carried out at Pointe Basse are many, and only a few examples exist in New Zealand of this kind of work on wild populations of birds. One is the study of Buller’s Albatrosses at the Snares Islands by NIWA researchers, and that of Red-billed gulls at Kaikoura. We’re able to understand how the rise and fall of human interventions in the bird’s environment influence the populations, and how long-term change such as sea-surface temperature or wind patterns can affect them. For France, a considerable logistical programme, run by the Institut polaire français Paul-Emile Victor (IPEV), exists to support this work conducted by some of the most scientifically productive research centres globally. 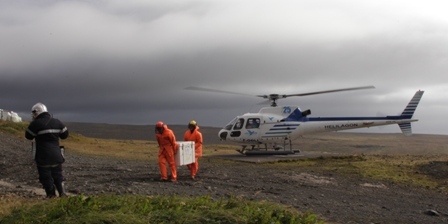 Researchers and logistical support staff unload scientific equipment at the Base at the Crozet Islands in preparation for the field campaign of 2013. Photo: Susan Waugh, Courtesy of Susan Waugh. Seasonal and annual field programmes are run, and supported by an agency which supplies the food, transport, health and safety requirements and logistical support and oversees the science content and environmental impact of the studies. The work of the Nature Reserve of the Terres Australes et Antarctiques Francaises (TAAF) ensures that the natural heritage of the sites is preserved and careful managed. This enables teams like the one I’ve been part of to address complex and nuanced research questions. In addition, the programme of deployment of young researchers (lead by IPEV), has seen thousands of budding scientists sent into the field for several months to over a year, for over 50 years, has built a community of committed, methodical and highly dedicated workers in the field, as well as influencing how other domains of science evolve, as the work-ethic and strong scientific culture of the polar research programmes has its influence as these people move into their professional careers. Hi Dee, it is a bit hard to tell from a ‘cursory’ one-month long look, but the study that I was helping with is detailing the foraging zones etc of the species. These birds forage at long distance from the colony(eg going right to antarctica), so differ from several of the NZ species in that respect. Keep an eye out for publications by Henri Weimerskrich and Samantha Patrick to get the gems on this over the next year or two. wow what fasinating place, do you see any differences in the albatross colony there to say in the sub antartic islands as far as influences on food sources, nesting habitat or chick behavour?